Raising money for your Roots of Freedom program can become a fun, educational experience in its own rite. The principles of liberty can be taught through your fundraising, which can be patterned after the Statue of Liberty event of 123 years ago. Did you know the United States almost did not receive the Statue of Liberty that France wanted to give us? Not until Joseph Pulitzer appealed to the common people of America was there enough money raised to build the platform for the Statue of Liberty. What caused Americans? attitude to change from apathy to excitement? You can read the full story here. Watch the music video of the Statue of Liberty here. Having the Roots of Freedom program in your school will create a lasting legacy that will bring pride and patriotism to your child?s education.
? why France wanted to give the Statue of Liberty to America?
? 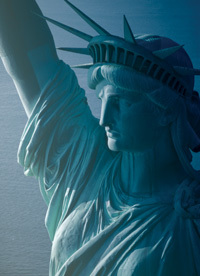 why the Statue of Liberty symbolizes liberty to the world? Brochure for schools to approach businesses with the pay-it-forward sponsorship concept. Businesses that participate in sponsoring schools can use this media kit for press releases and announcements. Businesses will also receive this beautiful plaque when they donate at least $500 to a school and become a Founding Father sponsor.